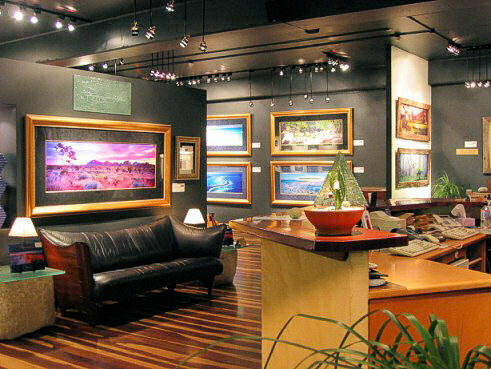 Without a real program for the evening in Cairns, we were happy to follow the tip to visit the Peter Lik gallery. When travelling along the coast, we found his postcards everywhere - in Australia it seems to be normal to brand postcards with the names of their photographers. Now his large panoramic photographs were deeply impressing for all of us. But for all people trying to become a reasonable photographer themselves, I'd like to recommand first to take some long intensive looks at his work. Do it, as long as you can bear and try to learn. After that, most people should be pretty depressed about their own archievements. This is the right time to take some of his little books and sit down on the sofa. Remember: genius is made of 10% inspiration and 90% transpiration. In the books one finds lots of the transpiration, simple pictures with blue skies for happy clients. Thousands and thousands of them must have been made finally to get time and money for the high-class ones. And for a final relief take his book of Australian animals, and you'll see: that's neither his love nor talent, that's only made because people want to buy it. So relax, he's not genial all the time, he's only a hard-working person with great archievements - nothing supernatural. 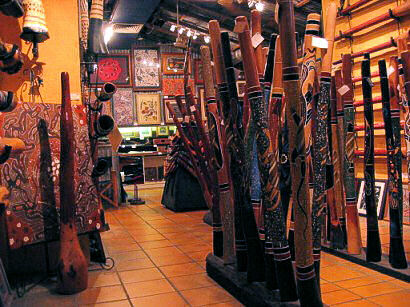 Right next door one finds one more of these unevitable didgeridoo shops. It is hard to imagine how they all can live, who buys such huge instuments only few people manage to play? And once the trick of the sound is done, one needs inspiration enough to make more than just noise. So they probably all end up catching the dust in some people's houses, proving their owners were in Australia having too much money. The didgeridoos I've seen used by aboriginals looked like their boomerangs do: without any decoration. In Cairns we stayed in the Palm Royale.